Would you give up your car, if a robot would ferry you where you need to go? According to Brian Johnson in his report Disruptive Mobility, when most vehicles are self-driving he predicts around 2025—new car sales in the U.S. could drop by 40 percent, while the number of cars on American roads could decline by 60 percent to fewer than 100 million. Many see driving as more of a chore than something pleasurable. Just a year since we saw its self-driving car prototype, Google is ready to go from the test track to public roads in California. The company moves to the next phase of testing, which will see vehicles with removable steering wheels, accelerator and brake pedals undergo the same testing that its modified self-driving Lexus SUVs were put under. Google prototype autonomous vehicles have already racked up "nearly a million autonomous miles" on its test tracks and have recently been driving 10,000 miles on their own each week. Although the idea is for the cars to operate completely free from human interaction, Google says the removable controls are there for a safety driver to take over if required. Of course, Mercedes (Daimler) is charging ahead, with its self-driving truck. The US Department of Transportation says about 33,000 people die on America’s roads every year. Enthusiasm for self-driving cars hinges in some part on their potential to reduce accident rates. Self-driving cars are being tested primarily in California and Nevada. With 11 accidents over six years, the Google Car is incredibly free of accidents. In two of the four cases, the car was doing the driving at the time of the crash. In the other two, the person behind the wheel had taken control of the car. The crashes were among the nearly 50 self-driving cars now being operated in California. Orbital Espresso? Yes, it is (ha ha) out of this world! When astronaut Samantha Cristoforetti wants to satisfy the all-too-Italian craving for an espresso, she can so so the way many Earth-bound coffee drinkers do, with the push of a button. Ms. Cristoforetti, the seventh Italian and the first Italian woman to venture into orbit aboard the International Space Station, uses a specially designed machine to create the optimal coffee beverage, high above the rest of us. LavAzza partnered with Italian space-food supplier Argotec to create the first-ever microgravity capsule brewer, to actually deliver the coffee-maker to the space station. 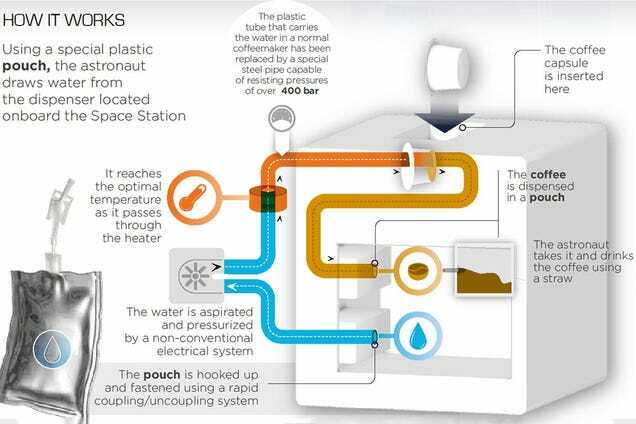 The space station is pressurized to Earth sea level, keeping the boiling temperature of coffee the same as we know it. But there can be no coffee grounds loose, which, in microgravity would quickly dirty up the station. To keep the rig contained with no risk for shorting out delicate scientific equipment while someone tries to draw a delicious crema, the machine has been engineered to European Space Agency and NASA standards. The an important deviation from sidling up to the bar at a café is that the coffee will be delivered into sealed packets, to contain the liquid. Tesla is offering a consumer battery, called the Powerwall, priced starting at $3,500, and derived from the batteries the car company uses in its Model S vehicles. When undertaking a major -- enterprise -- software project, it may be useful to consider Conway’s Law, named for Melvin Conway, which states: Any organization that designs a system (defined broadly) will produce a design whose structure is a copy of the organization's communication structure. I have seen a looming problem for many of my customers: making effective use of big data is impeded by data being scatted around silos, across departments or even teams. At Bluedog, we do not have a top-down model. The management is not hierarchical management, so Workbench doesn't focus on centralized tools or reporting, which many managers see as necessary to control workers. Bluedog's architecture is focused more on the needs of the end users than on the needs of management. Perhaps report proliferation indicates a hunger for data, but difficulty for business analysts to define what is important? If you've read my books, you know I have seen application structures evolve from the late 1980s from monolithic to modular solutions of this century, using techniques such as encapsulation and abstraction to reduce coupling and increase cohesion. With service oriented architecture, the purpose of doing so is obvious – the results are software systems that are easier to understand, change, reuse, and enhance. How has Bluedog been successful? We start with as small a team as possible. We avoid making architectural decisions at the top, but keeping the team "understaffed," to reduce the possibility of building complexity, or over-architecting. If possible, we put the developers in the same room as the customers, business analysts, GUI designer, database gurus. Proximity encourages communication.